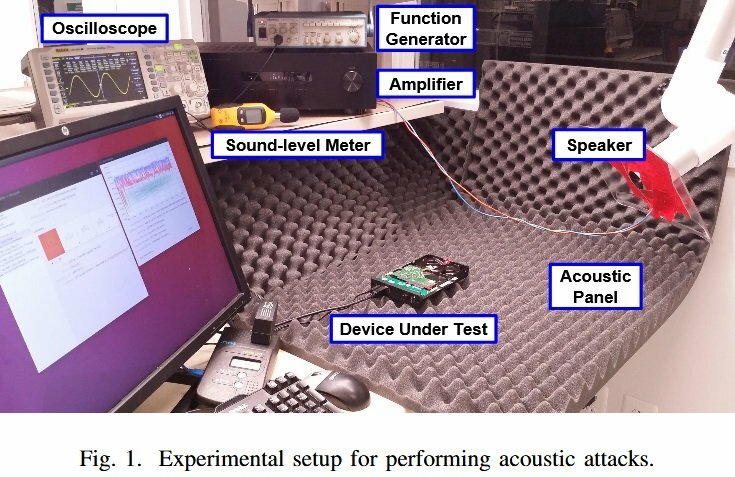 Attackers can use sound waves to interfere with a hard drive's normal mode of operation, creating a temporary or permanent denial of state (DoS) that could be used to prevent CCTV systems from recording video footage or freeze computers dealing with critical operations. The basic principle behind this attack is that sound waves introduce mechanical vibrations into an HDD's data-storage platters. If the sound is played at a specific frequency, it creates a resonance effect that amplifies the vibration effect. Because hard drives store vasts amounts of information inside small areas of each platter, they are programmed to stop all read/write operations during the time a platter vibrates so to avoid scratching storage disks and permanently damaging an HDD. Last week, scientists from the Princeton and Purdue universities published new research into the topic, expanding on the previous findings with the results of additional practical tests. The research team used a specially crafted test rig to blast audio waves at a hard drive from different angles, recording results to determine the sound frequency, attack time, distance from the hard drive, and sound wave angle at which the HDD stopped working.